If you happen to have a big bathroom with enough space to accommodate it, you should definitely consider getting as large of a steam shower cabin as possible. Not only will it ensure you have plenty of room to enjoy your shower without bumping up against the glass, but some of the large steam shower cabins are so large that you can sit back and relax in your private steam room with your partner. What’s more, even if your bathroom might not be quite big enough, you could always look at installing it in your bedroom so you can still enjoy all of the benefits of having a massive, luxurious steam room in the comfort of your own home. Still, better than simply being a combination shower and steam room, all of the models you’ll find listed below are actually whirlpool steam showers—meaning you’ll be getting a shower bath and steam cabin all in one. Of course, with so many different models out there, it can sometimes be hard to decide which one is right for you. So to help you out, we’ve reviewed our choices for the best big steam shower cabins out there—all of which are excellent options for anyone with enough available space to allow them to fit in comfortably. 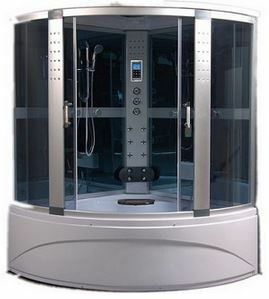 The SP9018 is one of the better steam showers with whirlpool that you’ll find, offering fantastic value for the price. As a corner quadrant model, it is designed to fit snugly into the corner of the bathroom and its chrome accessories and smoky glass ensure it will look beautiful in any setting. As far as the shower goes, this unit features both an adjustable hand showerhead on a riser and a monsoon overhead shower, plus twelve hydro massage back jets. Not only that, but you’ll get the added bonus of a 3 kilowatt steam generator that should provide more than enough steam for such a large cabin. Of course, as it’s a shower bath, you’ll also get the added bonus of a bathtub with fourteen whirlpool jets and a mobile foot massager. Still, to ensure you have the most complete, relaxing experience possible while enjoying the bath or steam, this model also comes with internal lighting, a built-in FM radio, and even an MP3 connection so you can listen to your favourite tunes. All in all, this is one outstanding large whirlpool steam shower that you’ll definitely love. The Alto ST from Aqualusso features a simple, stylish European design when compared to the others and is perfect for those who don’t have quite as much room to spare, but still want to enjoy all of the various benefits that whirlpool steam showers can provide. It contains most of the same features as the SP9018, including the radio, overhead monsoon, and MP3 connection, but with the added benefits of both Bluetooth connectivity and a built-in USB port, making it even more possible for you to enjoy music, audio books or any other sounds. Better still, as it features glass back and sides, it is much more rigid and sturdy. Not only that, it comes with a five year warranty so that you can be sure you’re purchasing a high-quality product that is made to last. For those who enjoy sitting down while you shower, this model also comes with a fold down seat that can be easily installed should you decide you want it. With this unit, you also have the choice between Polar White or Carbon Black, both of which come with stylish chrome fittings and allow you to match the Alto ST to any style or colour of bathroom decor that you could want. 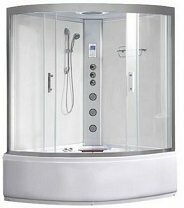 Best of all, with a price tag under £1400, this is also one of the most affordable whirlpool steam showers you’re likely to come across. If you’re in the market for a large steam shower bath, but don’t want something that takes up quite so much space in the bathroom, then the Insignia GT8059 is another excellent option. This elongated corner unit comes in both right and left hand versions, allowing you to fit it into any corner of the room and features stylish chrome accessories, tinted glass and a white acrylic tub. Other than the size, there isn’t much that sets this unit apart from the Alto ST—although it unfortunately is not Bluetooth enabled. However, it does come with a handy touch screen which controls all of its features and a built-in center seat, unlike the Alto ST which requires you to install the seat yourself. Plus, when you purchase this unit, you’ll be getting Insignia’s industry leading five year warranty so you won’t have to worry about buying a replacement should anything break. 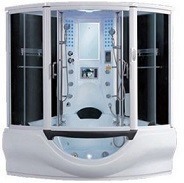 Overall, this model is absolutely stacked with features and surely one of the best steam shower whirlpools on the market today. Finally we come to SP160 – the biggest and most fully loaded model money can buy. This unit is absolutely huge, featuring more than enough room for two people to share it comfortably. As it’s designed for two people, it features twin hand showers, both on riser rails so you can adjust them to the perfect height—plus the standard overhead monsoon shower and five hydro massage back jets on each side. The whirlpool tub comes with 8 small jets, 6 larger ones, foot massagers and even underwater LED lighting and a waterfall inlet to add that extra special touch. Still, the real reason that this unit is out top choice has to do with all of its amazing entertainment features. Not only do you get the built-in radio and speakers with an MP3 connection, but this is one of the only models you’ll find that also comes with a waterproof LCD TV. Yes, you read that right—a TV! While the price definitely reflects this unit’s massive size and amazing array of features, if you’re searching for a large, fully loaded steam shower bath and have the money to spend—this is definitely the one you should choose, as it is truly the top of the line.